i don’t even know where to begin! 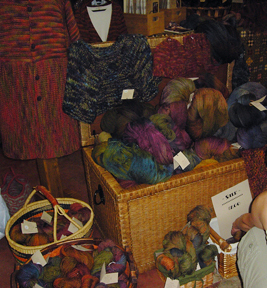 i took about 100 pictures and talked to SO many people at the wooster fiber show this weekend. there were animals, exhibits, classes, and shopping—what to tell about first? well, i guess first and foremost, if i haven’t mentioned this before, this show is NOT maryland!! and from what i hear, that is a very good thing. wooster is not about fitting the most vendors into a small area, or more bang for your buck, or a mall-of-america fiber experience. there are few large companies that are represented here, if any. this show is totally about the wonderful small- and micro-producers from the region. that said, it was still a little crazy and crowded on saturday, so i went back early on sunday to take pictures and talk to the vendors. i was trying to organize the information last night, because there are so many great, small producers that come to shows like this, that you would never hear about otherwise, but too much about them to put into one post. and i definitely want to interview several of them later, so you can read about their interesting lives and their products in detail. 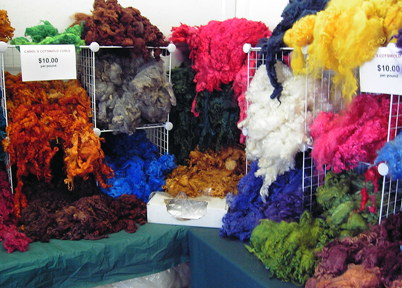 one thing almost always comes to light when conversing with small producers at fiber shows: so many of them have done what a lot of us dream of doing—left their established careers to start something completely new, which satisfies them in a different and creative way. spending your weekends here, instead of stuck in a hi-rise office certainly has its appeal . . .
i’d like to tell you more about that aspect of the fiber life through closer examination later on. i mean, c’mon—doesn’t margaret myer look happy (and young!)?? 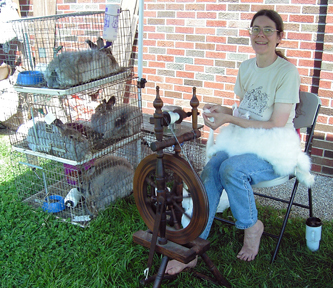 she’s raising angora bunnies and it obviously agrees with her! so today i’ll try to show an overview of my adventures at the fair, and then i will cover each of the standout vendors in later posts with interviews. and even at that, today’s post may run into tomorrow . . . and that way, i can spread out the pictures of my purchases (which i like to think of as few, but significant . . . and yes, i’m kidding myself, but it works for me). 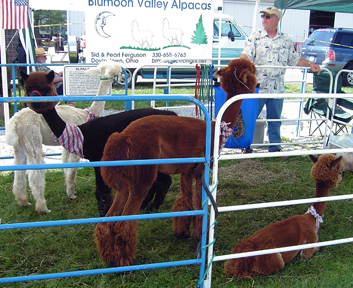 i did manage to stay away from the alpaca; i have enough of that at home, but really, it took a lot of fortitude . 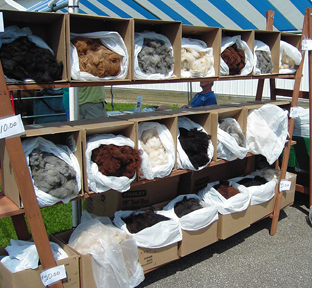 . . ohio is the nation’s largest producer of this mighty fiber, and at any show you will find a plethora of choices in every imaginable color, at unheard-of prices. 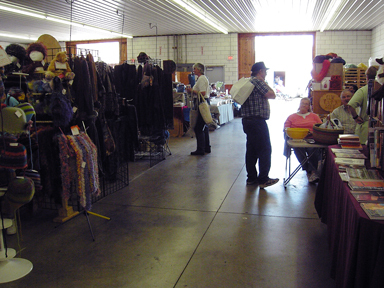 instead, annette and i made a beeline for the fleece show area and the Wooly Knob Fiber Mill, Inc. booth, since we had fleeces to drop off for processing, and some to purchase as well. debbie j is going to split fleeces with me this year. 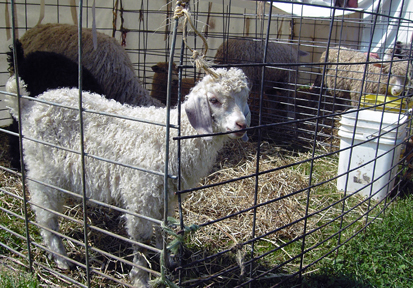 to get her to stop lusting after, and plotting to steal, my cormo fleece from last year, i purchased us another lamb’s coat from Winterhaven Fiber Farm. i dropped that at the wooly knob booth, which saw a lot of action all day. in the few years they’ve been in business, matt and jamie have garnered a good share of the region’s processing work. throughout their growth, they have been enthusiastic, entertaining and inspiring; they quit their jobs to start the mill and to live a better life. 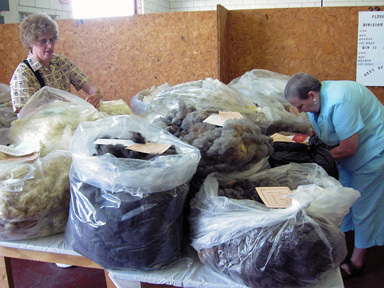 in addition to processing our wool, they also produce their own fiber blends for spinning, incorporating recycled clothing that has been shredded, as well as their hand-dyed fiber (and you know i love me some recycling!). 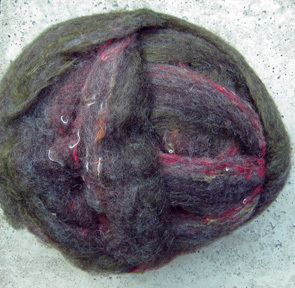 i always buy some of this wool; it is a dream to spin and gorgeous! i bought enough of this one for a sweater. and now they have jamie’s parents rooked into it too—they recently opened an adjunct business over at their place—Aunt Aggie’s Spinning Mill, where you can get your roving spun into any yarn you like. jamie’s sister is producing goat’s milk lotion and soap . . . is this an empire in the making? anyway, we just love them and are really happy for their success! i was longing for the brown one with the red ribbon as well, but i walked away. then i came back, but i walked away again; it was just a little too expensive for me. and on sunday i looked at it one last time . . . and i walked away!! tell me how proud you are. then we got started on the vendors—we had only a couple of hours to browse and shop before our classes began, so we raced around a little, then realized how stupid that was, and started to relax! 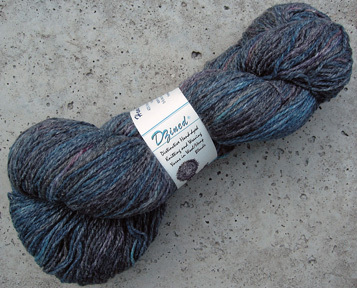 there was wool and hemp blend yarn from DZined. at the same booth where i bought the cormo fleece, i spied something that made my heart sing! really cool buttons! we don’t have any place here to look for great buttons; i sorely miss the button shops in NYC, which i used to prowl through for wonderful finds. 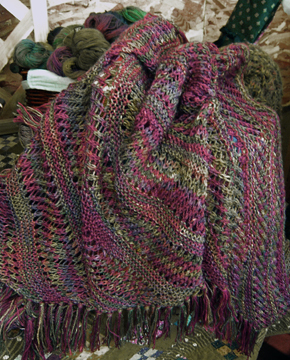 but here at Winterhaven Fiber Farm, i found something i love. hand-cut horn and antler buttons, with really quirky edges. when i knit with handspun yarn, i like the textures of buttons made from natural materials. these are perfect! next i saw dave lewis, tucked into his corner at the information booth. dave belongs to the spinning guild that i participate in and is talented in myriad ways, which will be spotlighted in a later post just about him. 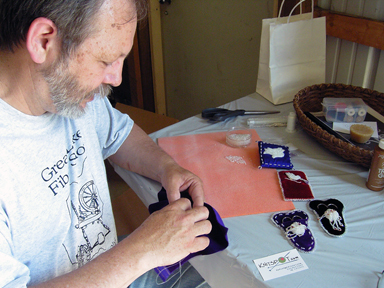 here, dave is doing some beadwork using a paper pattern—similar finished items sit nearby (he insisted on including the knitspot business card in the photo). dave is also an awesome high school science teacher, and as you can see, pretty happy to be almost done for the summer. 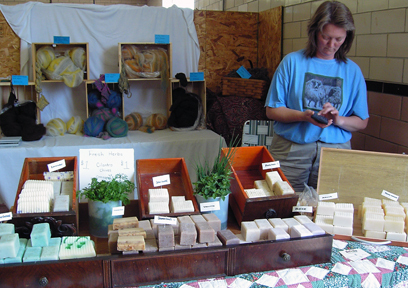 HoDoBe soap and wool is another vendor i visit every year to be sure i get some of her wonderful soaps. she makes a mean patchouli/oatmeal one as well as a cinnamon/oatmeal bar that i love. this year she has added some new ones made from goat’s milk (hey, is this a trend??) that i’m trying. nothing like following a swift, hot bike ride with a fragrant shower . . .
then i saw it. 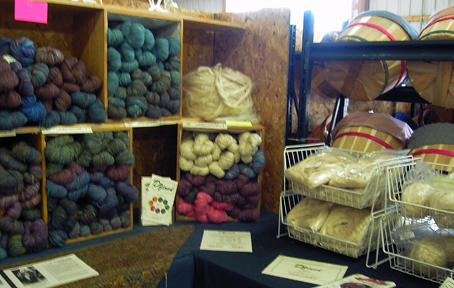 the Briar Rose Fibers booth. this is the place where my resolve melted and i spiralled into a black hole of yarn shopping and ruination. i DO remember being amazed at the colors and choices. i also remember feeling my first hank or two, and speaking with the lovely proprietress (whose name i asked, and thought i would remember, and i think it might be chris, but i can’t find it on her site, so please email me so i know!). but i’m afraid that halfway through that conversation, my speech began to slur and fade as i turned dizzily, not knowing where to begin pawing through yarn first. you can see from the blurry photographs that my blood sugar was dropping rapidly. so, you can then go on to deduce (and excuse) what happened next. i mean, it wasn’t a massacre of my bank account exactly . . . it’s just that i was being SO good, and i had PROMISED myself i would not buy a bunch of yarn. 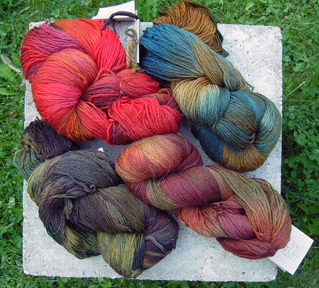 the merino/tencel blend is soft, lusciously colored, and has a beautiful sheen. i just want you to know that no, i did NOT grab the whole basket in my arms and run. i wanted to, but i did not. and you know i would never do anything so undignified. instead, i just dumped it out and inspected each and every skein, positioned in such a way that no one else could (or would dare) approach the area. a 500-yd. hank makes this shawl, so i bought two (different ones), and one of them is the last hank of a similar yarn that contains silk. and then . . . well, then i discovered the merino/nylon superwash sock yarn basket. everyone is quite aware that i do not need more yarn, especially not sock yarn. maybe i can use it for christmas gifts . . . oy, oy, oy. but honestly, can you blame me?? i even dragged annette back to this booth so she could commit similar acts of injustice to her wallet. i just knew she’d dig this yarn! 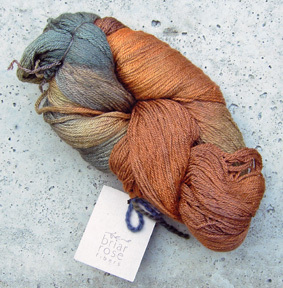 we will be talking again with this wonderful dyer about her business and her life for a future post. that is, if i can manage to get her name right (i can’t help it, i just keep thinking of her AS briar rose . . .). and who knows, if we get to the michigan festival this year, we may even get to visit her workshop! by now, it was time for classes, which took up all of saturday afternoon. i’ll stop here, and let you catch your breath til tomorrow’s post. i don’t want to bore you by running on and on and on. oh yeah, i do that every day without giving it a second thought. hmm. Hi Ann!!! It’s Chris – you were right!!! So you had some blood sugar in your body after all! Thank you ever so much for your kind words about my booth and my products. It was such a pleasure to meet you! 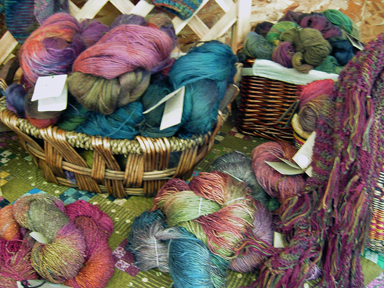 You did a fabulous job of capturing the Fiber Festival essence in your photos on your blog. 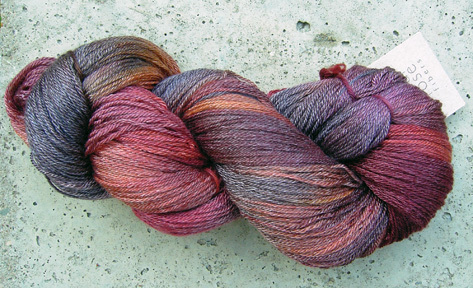 I could never get tired of watching yarns and wools! I see Chris commented. Dangit! I was hoping to parlay my knowledge of her name into information about that gorgeous blue and copper skein with some silk in it. I can’t seem to find it on her site. (Yeah yeah I know, last skein etc…but it might have been jsut the last skein she had with her…hey, a girl can hope, can’t she?) I’m so glad you had a good time, and are generously sharing your pictures, it really helps those of us who can’t attend fiber functions and rely on the internet for fiber fixes. Thanks for all the kind words about the Great Lakes Fiber Show. The pictures are great. 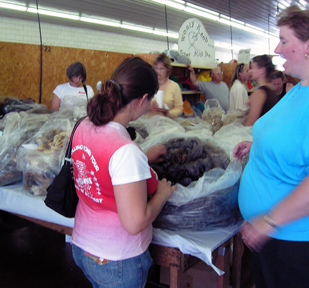 I’m the organizer of the Show and I’m in the picture with the wool judge. I think I have your gray fine fleece. It was left at the Show.